This profile is part of the Pathology and Laboratory Medicine (PaLM) domain, which merged the former AP and LAB domains since 2016, January 4th. Laboratory Device Automation (LDA) supports workflow in the automated technical section of the clinical laboratory, also known as the "work area". 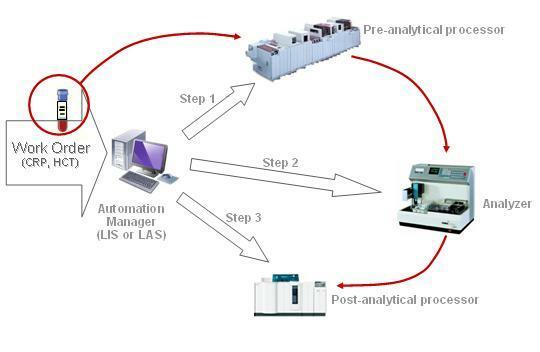 The Laboratory Device Automation (LDA) Integration Profile covers the exchanges between an Automation Manager (Actor played by a Laboratory Information System LIS or by a Laboratory Automation System LAS) and a set of automated Laboratory Devices (LD) to process a Work Order, perform the tests on the related specimens and retrieve their results. This processing includes the pre-analytical process of the specimen (sorting, centrifugation, aliquoting, transportation, decapping) the analytical process itself (run of the ordered tests on the specimen) and the post-analytical process (recapping, transportation, rerun, storage and retrieval). The scope of this LDA profile is strictly restricted to automated devices operated inside a clinical laboratory. Whenever the same devices are used on the point of care and operated by the ward staff, they are taken care of by the Laboratory Point Of Care Testing Profile. The input of the workflow is a Work Order: A set of tests requested on one or more specimens, to be fulfilled by the Automation Manager. This Actor splits the Work Order into a sequence of one or more Work Order Steps (WOS). Each WOS represents one action to be performed by one device on one specimen. Streamlines specimen processing in the work area of the clinical laboratory. Reduces the processing time and accelerates the delivery of test results. By providing clear specifications of interfaces between Laboratory Automation System (LAS), and the various types of automated devices this profile enables a laboratory to replace a device by a new one without breaking the existing workflow in the work area. Rerun on the Analyzer, automatically launched by the analyzer or requested by the LAS at technical validation time. Unsolicited QC results sent by the device. Each of these transaction selects a subset of HL7 message structures (based on OML, ORL and OUL) and specifies a set of constraints applying to each message structure, as well as the responsibilities of the sender and receiver. The Actor Automation Manager can be played either by a Laboratory Automation System (LAS), which is a system dedicated to the work area of the laboratory, or by the Laboratory Information System (LIS), which usually supports the capacity to connect some if not all the automated devices of the work area. In frequent organizations a laboratory may combine a LIS and one or more LAS, each system handling a subset of devices. The analyzer, which performs tests and produces observations related to a specimen. This page was last modified on 1 August 2017, at 05:27.